What’s more, they reached this agreement all the way back in September, with details only coming to light now. According to Wyofile, U.S. Fish and Wildlife Service Director Dan Ashe penned a letter to the directors of Idaho, Montana, and Wyoming’s state wildlife agencies, stamped September 25. Ashe was responding to an earlier letter sent on behalf of the Idaho Department of Fish and Game, the Montana Fish, Wildlife & Parks agency, and the Wyoming Game and Fish Department, dated August 28. 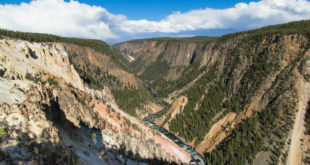 The letter outlines two meetings held September 9-10 and 14 with federal and state wildlife agency staffers as well as representatives from the National Park Service, U.S. Forest Service, and U.S. Geological Survey. The second meeting included representatives from the Association of Fish and Wildlife Agencies. Below 600: no discretionary mortality would be allowed unless necessary to address human safety issues. Between 600-673: mortality limits will be less than 7.6% for adult females and 15% for adult males. At 674: mortality limits will be 7.6% for adult females and 15% for adult males. Between 675-747: mortality limits will not exceed 9% for adult females and 20% for adult males. Greater than 747: mortality limits will not exceed 10% for adult females and 22% for adult males. Wyoming wouldn’t manage grizzlies down to a minimum number, whatever that turns out to be, Nesvik said in November. In that interview, he said no final number had been agreed to. “We have not discussed that to this point,” he said. Wyoming’s wolf plan hews closely to the minimum population requirements set by the federal government. But wolves, as a species, reproduce faster than grizzly bears. Wyoming knows how to set big game and trophy hunting seasons, he said. “I think we would rely pretty heavily on our track record,” Nesvik said. For example, with black bears and mountain lions, “there’s certainly more [hunting] opportunity than there’s ever been,” he said. Three critical pieces are necessary for delisting: a conservation strategy outlining long-term sideboards to ensure grizzly survival, an official proposed rule that sets administrative and legal parameters, and a document on population monitoring. After those are ushered through federal rulemaking and possible litigation, states would take over. This year has been nothing short of eventful regarding Yellowstone grizzly bears. Earlier this year, a bear was put down after killing a hiker. The bear’s cubs were then sent to the Toledo Zoo. Another pair of grizzly bear cubs were relocated outside Yellowstone after their mother was put down for raiding apple orchards. And in Park County, WY, talk of delisting Yellowstone grizzly bears circulated. Overall, grizzly mortality numbers have been high this year, especially this fall as bears foraged for hibernation fuel, although a study in Molecular Ecology found the Yellowstone grizzly bear stable and genetically diverse. Earlier in November, American Indian tribes went on record in the Missoulian protesting a possible delisting.